In this tutorial, we're going to build a very simple system for creating your own friends lists so your players can search for friends, send their friends invites, and get information about their current friends for use in Challenges or chat later on in your game. Important! If you're working on a new game that was created after the Game Data Service was launched in January 2018, you won't be able to create new Mongo Runtime collections and the Cloud Code used in the tutorial will not work. For the alternative tutorial for new games using the Game Data Service, see Creating Custom Friends Lists Using Game Data Service. Before we can start searching for players to add to our list we need to be able to get a collection of player information we can query so that we can filter our search requests. In this example, we'll be storing some of the important player information in this player list so we can search for user-names, countries, and so on. Therfore to start, we'll create a new player-doc each time a player registers with GameSparks and we'll do this in the RegistrationResponse script. 1. Go to Configurator > Cloud Code. 2. In the Scripts panel, select the Responses folder. When the player has been registered, we can see a new entry for this player in the playerList collection in the Data Explorer tab. Select the collection and click Find to see the documents in this collection. Next, we'll create a request so that we can add information to our player-documents. Others can then use those details to search for us. In this example, we'll add some Attributes like country, city, and level to the Event. However, you can add other Attributes you think your players might want to search for. 1. Go to Configurattor > Events. In this example, we'll call the Event updatePlayerInfo because we're not only going add information here, but we can also update existing information (like display name or user-name). Player's ID is not Updated! Note that we'll never edit the player’s ID. This is our link back to the player’s GameSparks account and it's important that the playerId always remains the same. Notice that we've given each of these Attributes a Default Value. This allows you to leave out the Attributes you don’t want to update. For instance, if you later wish to only update the value for the username Attribute, then you can just use that Attribute in the request. We’ll see an example of this later. 2. In the Scripts panel, select the Events folder. So now that players can be searched for and we can load players using the playerId, we are ready to make our search Events. 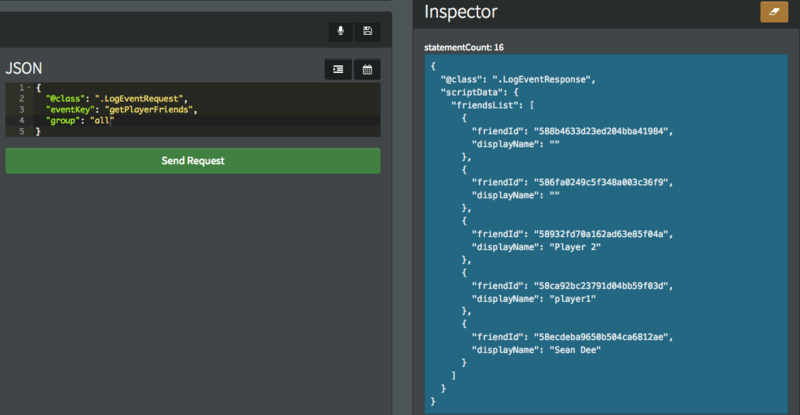 We are also including another query in this code, to make sure that we don’t include ourselves in the player-search. So we use the $ne (not-equals) operator to exclude ourselves for the search. At the moment, we only have one player registered, so we're going to have to register a few more players and add information to their documents in order for this to work properly. Once you have some new players registered, we can test this out in the Test Harness. The query field we're going to use here is just the field we want to check and the value we want to search for. This will also work for level or city. 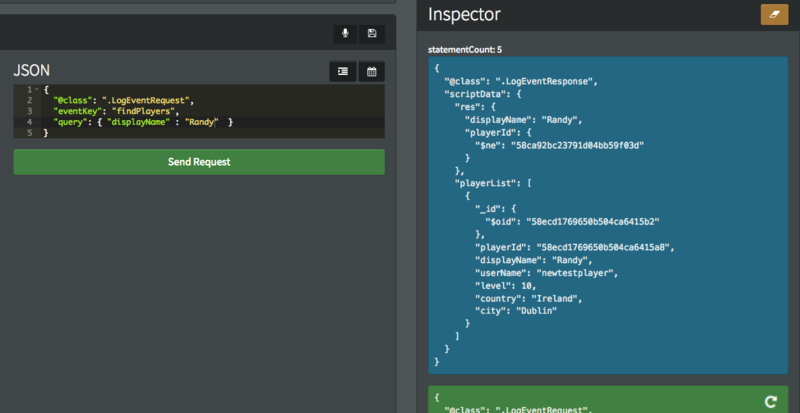 Just play around with the query to find out how you might want to use it. You could also add more complexity to this request, such as returning a limited number of players or filtering out the player data for privacy reasons. We need to check to see if the friend has declined a previous request. We'll track this in the playerFriends collection. We send a message to the player and create a log in playerFriends to track that we’ve a pending friend request with that player. So we'll need to create a new ScriptMessage and a new Event. The message is going to be very simple. It’ll have a default title and message, and we’ll use the Short Code to send it from our Event. 1. 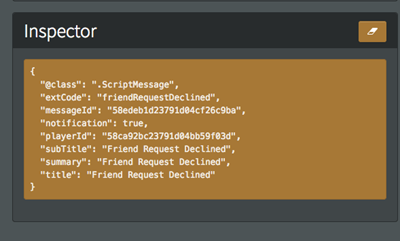 Go to the Configurator > Messages and select the ScriptMessage Extensions tab. Don’t worry too much about this message at the moment because we'll be setting our data for it later. The most important Attribute is the player_id - for the friend we are inviting. We'll also add a group Attribute - so we can group our friends by family, work, college, and so on. 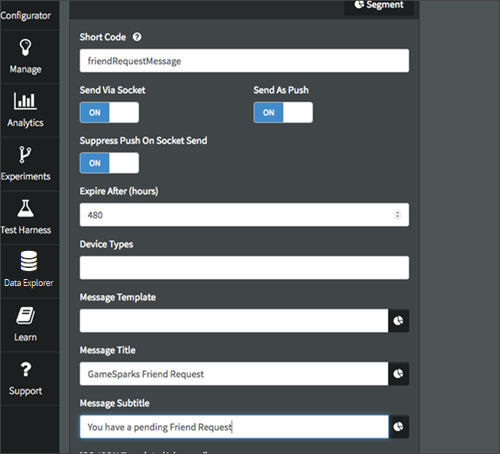 Finally, we're going to add a message Attribute - to allow us to send a custom message to the player we want to invite. Notice that we've entered Default Values for the group and message Attributes. This is because we shouldn’t require these to send a friend request. We can leave these out and just send the basic template of the message. In the Cloud Code for this Event, we want to check that the requestId is valid, and, if so, we'll update the document in the playerFriends collection to say that the request has been accepted. This friend’s details will then show up in the player's list of friends (which we'll create an Event for later). The last thing we are going to do is implement a system for notifying players when their friends come online. This is going to require a new ScriptMessage and in this case we'll use a system-script instead of creating a new Event. 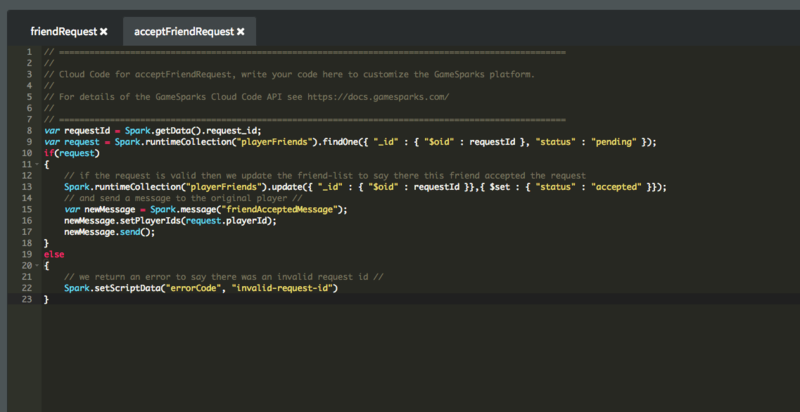 GameSparks already has a script that runs when the player comes online which we can use in this case. 1. Go to Configurator>Cloud Code. 2. In the Scripts panel, select the System folder. To test this, all we need is to login through the Test Harness with two players. 1. Authenticate a first player and keep them logged on. Add a player's information from the playerList collection to the list of data returned when you get your friends. This would allow you to include things like avatars or other personal information about your friends to your game. You can also allow friends to use privacy options to check which details they want you to have access to, or how they appear when you search for them. The important thing is that, once you have the friends list, you have access to the playerId of any of your friends. You can then use this playerId throughout the GameSparks APIs to set up Events, Matches, Challenges, or Teams to include your friends.